For many of us, a dog is our best friend. They're always ready to play when we're happy, they comfort us when we're sad, and they're always ready to forgive and forget. Their constant, loving companionship makes it easy to understand why they're often called "man's best friend". Dogs are a big part of our lives and allowing them to live in comfort is important to us. Today, a large number of dog houses are available to meet all of your dog's needs - but you have to know where to find them. Typically, local pet stores and pet boutiques will offer only a couple of the best selling or unique models. However, you might be surprised by the actual number of dog houses that are available to you. From sturdy, large, dog houses, to pink, fur trimmed, chic homes for your spoiled pooch, the choices seem endless. With almost 100 dog houses to choose from, it's hard to top this site. We were impressed to find everything from Indoor and Outdoor houses, Wood and Igloo homes, and even mini cottages. 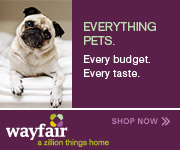 Wayfair offers a wonderful selection, great prices and a fair return policy. Considering Petco is one of the largest known pet shopping stores in the nation, we were not surprised at how well organized this site was. Petco has a nice variety of dog houses to choose from as well as great customer service to make sure you are satisfied the whole way through. Petco offers a nice selection of practical dog houses, at a fair price, and with a great return policy. Petsmart has a smaller, reasonably priced selection of dog houses. Easy navigation makes for a fast, non-stressful shopping experience - only hindered by their limited selection. Dog has wood dog houses, plastic dog houses, dog houses shaped as an ottoman, indoor and outdoor houses, igloo houses and much more. However, this site makes you work harder to find the product you're looking for. Also, the product pictures were too small to see very many details. Selection. Does the website offer a variety of dog houses to choose from that meet the quality, price and appearance you're looking for? Return Policy. If you aren't fully satisfied with your dog house purchase, can you get your money back? Cost. Last but not least, how do the prices between competitors rank? Budgets are important - will you be getting the best price available for a quality dog house that meets your needs? TopConsumerReviews.com has reviewed and ranked the best dog house stores available today. We hope these reviews help you find a dog house that makes both you and your loving canine companion happy for years to come! The nontoxic, sustainable product is very sturdy and easy to build. The cardboard is recycled and compressed to form strong panels. The house is big enough to accommodate several cats or small dogs.